In a saute pan over medium heat, add the olive oil and heat. Add diced onion, peppers and garlic and saute until translucent. Remove from heat and place in a large bowl. Allow to cool. This can be done ahead of time.In a food processor, lightly chop the drained black black beans and chickpeas. Do not chop so much it becomes a puree. Add the beans to the sauteed vegetables and mix thoroughly. Add remaining ingredients. Thoroughly mix all ingredients and form into 4 patties, cover and refrigerate for 30 minutes. Patties can be made up to one day in advance. Preheat the grill and brush additional olive oil on the burgers before setting them on the grill. Grill for about 4 minutes on each side. Serve on a toasted bun with condiments as desired. Using a melon baller, scoop flesh from cantaloupe and honeydew into balls; set aside.In a large glass or ceramic bowl, combine the sugar, lime juice, lemon juice, orange liqueur, and lime peel. Stir well to dissolve sugar. Add the cantaloupe and honeydew balls, strawberries, and grapes. Toss gently to combine. Cover the bowl with plastic wrap and refrigerate for at least 1 hour to blend flavors, stirring once or twice.Spoon the fruit mixture into serving bowls or hollowed out melon halves, dividing evenly. Serve immediately. VARIATION: For a tropical fruit version, substitute kiwi slices, pineapple chunks, papaya slices, or mango cubes for some of the melon balls. Add a little grated fresh ginger or ground ginger, A dash of coconut extract would also make an intriguing addition. Try serving this version in a hollowed out pineapple half. Place meat in plastic bag; set in deep bowl. Combine remaining ingredients. Pour over meat; close bag. Marinate 6 to 8 hours or overnight in refrigerator; turn several times. Drain meat; reserve marinade. Pat excess moisture from meat with paper toweling. Insert spit rod through center of roast. Adjust holding forks; test balance. Insert meat thermometer near center of roast but not touching metal rod. Place medium coals around drip pan. Attach spit; position drip pan under meat. Turn on motor; lower hood or cover with foil tent. Roast over medium coals till meat thermometer registers 140 for rare(2 to 2 1/2 hours). 160 for medium and 170 for well done. Brush frequently with marinade during the last 30 minutes of roasting. Let stand 15 minutes before slicing. If desired heat remaining marinade and pass with meat. Clean the mushrooms and take out the stem. Soak the mushrooms in the soy sauce for 20 minutes. Grill over a medium heat or flame until warm and marked with grill marks. Turn the mushroom over and top with the gargonzola cheese. Close the grill lid to melt the cheese.Brush the buns with a little olive oil. Grill until just warm. Assemble burgers and top with lettuce and serve with additional condiments if desired. Drain pineapple, reserving 1/4 cup juice, set juice aside. In a bowl combine all fruit together. In a small bowl, combine lime juice, honey, lime peel and reserved pineapple juice. Pour over fruit, gently toss to coat. Place the unpeeled sweet potatoes in a large pot of water and boil until a fork can just pierce the flesh. Drain and let cool. (You can boil them a day ahead and place the potatoes in the refrigerator until you need them. )Scrape off the skin using a paring knife. This works best when the potatoes are still slightly warm. Cut each potato into eight wedges. Brush with the oil, then sprinkle with salt, pepper and parsley. Grill over medium heat or flame until golden brown on all sides. This will only take a few minutes per side. Serve hot. In a saucepan, combine strawberries, green pepper, green onions, salsa, the juice from one half of the lemon and the honey. Let sit, refrigerated, for at least on hour.Prepare your grill and put the saucepan of salsa over the fire to heat up. When ready to cook, brush the salmon with olive oil on both sides. Place on grill about 6 inches from charcoal and grill about the same on the other side. When you turn the salmon, coat with some of the salsa. Transfer salmon to serving plates and top with the salsa. In a glass bowl, combine the honey and cherry juice. Add the pineapple slices and let marinate in the refrigerator for a hour. Preheat grill to medium heat and lightly oil grate.Remove pineapple from dish or bowl, discarding any leftover marinade. Place pineapple wedges directly on rack or in a a basket and grill for about 10 minutes, turning, until pineapple is hot and carmelized. Stir together 1/2 cup soy sauce, Sherry, sugar, 1 1/2 tbsp garlic, 1 tbsp sesame oil, and 2 tbsp sambal in a 13x9x2" baking dish until sugar is dissolved. then add steaks, turning to coat. Marinate steaks, turning once, 1 hour. Prepare grill for cooking.Stir together cilantro, oil, lime juice, remaining 3 tbsp soy sauce, remaining 1 1/2 tsp garlic, remaining 1/2 tsp sesame oil, and chili if using. When fir is medium-hot (you can hold you had 5 inches above rack 3 to 4 seconds), grill steaks on a lightly oiled rack 3 to 4 minutes on each side for medium rare.Let steaks stand on a cutting board 5 minutes. Slice steaks diagonally into 1/4 inch strips. Serving: Serve on a plate beside lots of baby salad greens, drizzle steaks and greens with sauce.Remaining sauce should be available on the table. For a gas grill, preheat with outer burners on medium, center burner on low. (For a charcoal, set up for indirect cooking.) Clean grill well. In bowl whisk eggs; whisk in sugar, vanilla and a pinch of salt. Gradually whisk in buttermilk and cream. Transfer mixture to shallow baking dish. Working in batches if necessary, soak bread slices 1 to 2 minutes per side. With tongs, oil grill with paper towel dipped in cooking oil. Lay soaked bread slices on cooler part of grill; grill about 2 minutes until golden brown. Turn and repeat on other side. Serve right off the grill with Rhubarb-Pear Compote. In an oven proof shallow pan, combine all ingredients. Pour into a shallow pan and place on the grill over a medium high heat with the lid closed. Stir occasionally. When the rhubarb and pears become soft, remove the lid and let more of the liquid evaporate to create a thicker sauce. Serve hot or warm over the grilled bread pudding slices. Spray bottom of 9x13 pan with Pam. Mix coconut and pecans and spread in pan. Pour mixed cake mix over pecans and coconut. In a separate bowl, mix cream cheese, margarine, powdered sugar, and vanilla well. Drop cream cheese mixture by teaspoonfuls over batter. Do not mix! (There appears to be a lot of this mixture-covers almost entire cake.) Bake at 350 for 50 minutes or until done. If checking with a toothpick, be sure to insert it in an area of only cake mix as the cream cheese mixture will remain moist and the toothpick will not come out clean. To make simple syrup, bring fresh raspberries, juice of 1/2 lemon and Port to a boil. Cook mixture until volume is reduced by half and mixture begins to thicken. Remove from heat and cool to room temperature.In the work bowl of a food processor, blend olive oil and raspberry vinegar. Add simple syrup mixture and remaining lemon juice. Blend until vinaigrette is thoroughly combined. Arrange lettuce leaves on 6 salad plates. Pour vinaigrette over lettuce. Divide orange segments, strawberry slices and walnuts among serving plates. Cook and cool rotini. Prepare and mix remaining ingredients and toss with dressing. Let sit in fridge for a few hours to soak and blend flavors. If sits overnight, may have to add more dressing because the pasta absorbs. Slash fat edges of meat, being careful not to cut into meat. Place roast in shallow baking dish. In small bowl combine catsup,vinegar, oil, coffee crystals, salt, chili powder, celery seed, pepper, garlic powder, hot pepper sauce and 1/2 cup water; pour over roast. Cover; refrigerate 6 to 8 hours or overnight, turning several times. Remove roast from marinade, reserving marinade. Remove excess moisture from roast with paper toweling. Grill roast over medium coals for 20 to 25 minutes. Turn roast; grill 10 minutes. Brush roast with marinade. Grill for 10 to 15 minutes more for rare to medium rare, brushing occasionally with marinade. Heat remaining marinade.To serve, carve meat across the grain in thin slices. Pass heated marinade. Thanks @Geee for your regular posting of such good things. Does your family know how fortunate they are you are such a creative and good cook? @Geee, I have been on a kick lately of trying to make NEW-to-me recipes. I think the easiest, and almost a cop-out, was making individual pineapple upside down cakes in large muffin pans. That was a hoot. The recipe said to just use part of a slice of pineapple, but I jammed one entire piece in the bottom of the muffin pan (on top of the butter/brown sugar mixture, of course. And a whole marischino cherry for each one. I really, really liked this. I did have some problems getting them out of the pan until I realized I was not successfully running a knife around the edge well enough. We ate them all . 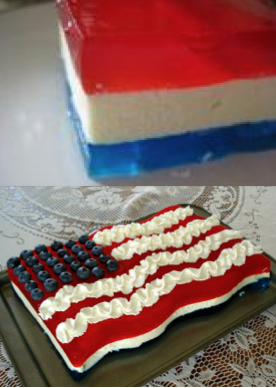 . .
Next I am going to try the red-white-and-blue Jell-O for 4th of July, and may figure some kind of 4th theme for the Cake Batter Rice Krispies Treats by using red, white and blue sprinkles. Prepare berry blue Jell-O according to directions on box. Pour into 13x9 baking dish and place in the refrigerator. Allow to chill until firm, about 1 hour. Prepare lemon flavored gelatin using 1 cup of boiling water. Beat cream cheese slightly and then add the lemon gelatin mixture. Beat gelatin and cream cheese until smooth. Set aside and allow to cool to room temperature. Once the cream cheese mixture has cooled, fold in the whipped topping until mixed thoroughly. Pour this mixture over the firmly set bottom layer. Return to the refrigerator and chill until firm, about 1 hour. Prepare raspberry Jell-O according to directions on box. Cool this mixture until room temperature and then pour over the middle cream cheese layer. Top with a little whipped topping and a couple of blueberries, if desired. Grease a 9"x13" baking pan with butter or non stick cooking spray. Set aside. In a large saucepan melt butter and marshmallows over medium heat, stirring occasionally. Reduce heat to low and stir in cake mix and vanilla until just combined. Stir in half of the Rice Krispies and 1 tablespoon sprinkles; mix well. Add in remaining Rice Krispies and stir until combined. Pour mixture into prepared baking pan and spread evening. Microwave chocolate in 30 second intervals until melted. Drizzle over rice krispies. Sprinkle with remaining sprinkles. @Chickadee. I love love Pineapple Upside Down cake. Mom used to make it for my BD sometimes. She always gave me a choice between that and her special cheese cake which we have not been able to find the recipe for She left 4 cheese cake recipes in her recipe box and none of them are the one she used. Your yummy pics are making my mouth water again this morning! I, like you, @Geee, have one recipe from my Mother that I cannot find. It was a combination of graham cracker crust, some kind of lemon/pineapple cheesecake in the middle and a strawberry cheesecake on top. Neither my sister, brother nor I have been able to replicate it, and yet we all remember it as being one of our favorite things she made. Most of her recipes, however, were made from scratch and I often take shortcuts when making them. Then, of course, they are not quite as good . . . DUH! @cudjo, I will try the fresh pineapple! It sounds really good. Chickadee. That sounds like an amazing cheesecake. I tell so many of my nieces and cousins to make sure they get recipes that they love from their aunts, parents etc. before they are lost forever. I floated the idea of a family recipe collection, but never got any co-operation and alas it is now too late. Only one of my five aunts is still alive and she cooked the least of any of them. My mother was a good cook, but my three oldest aunts were the masters at the Polish recipes that were passed down from my grandmother and great aunts. She died when my mom was five, so mom never got to cook with her.